Okay, here they are. 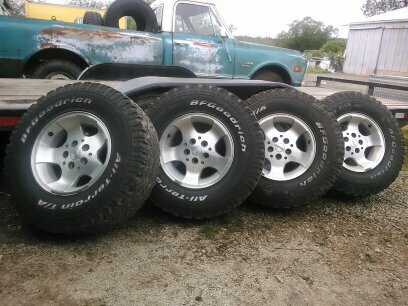 These are the wheels and tires that were on my project Ole Red Jeep XJ, when I bought it. They are the cool looking (in my opinion) factory jeep wheels offered on Cherokees, Grands and even those evil Wranglers. So, with the 31x10.50x15 BF Goodrich All terrains mounted on them, they will bolt right onto any one of those kinds of Jeeps. These wheels and tires have already been posted on Craigslist so if you want them get ahold of me quick by post here, PM, call or test. The number is 360-929-5518. Ask for Brian. The price is $400.00. Please don't waste my time or yours by low balling me. The wheels are perfect and the tires are in decent shape. I will even throw in a full set of chrome lug nuts that fit these wheels. Just bolt them on and go, cruising or wheeling with your Jeep looking awesome!!! Im a long way from you buddy. Way north and west of you in Washington state and the tires and rims sold a few days ago.